SoftSphere Technologies sponsor us 15x DefenseWall Licenses for our readers. DefenseWall is a very recommended extension to your Antivirus solution. It improves drastically the protection from malware, Adware, Spyware. The anti-malware protection system block malware to call home and attack trusted processes via listening ports, bypassing untrusted zone. It is also possible to block single applications in the Firewall from connecting online on your system by modification the rules (call homes). 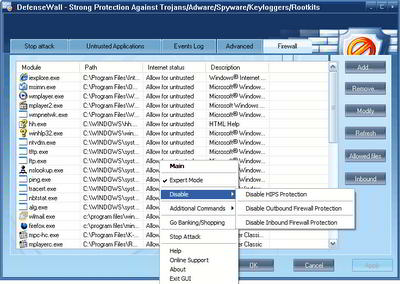 DefenseWall shows all applications which are connected to the internet so you easily see on your system if there is strange activity running and it will ask you as soon anything want send data over the internet which is typical for Trojans, Malware and there likes. The HIPS Protection (Host Intrustion Prevention System) also detect attacked processes. When you want to install legitimate software or updates for example Adobe Flash Player or updating your Web browser extensions/addons, remember to run it as "trusted" or else the installation will fail. All what you run as "untrusted" doesn't make permanent changes to your system and will remain only until you reboot the PC - like in a sandbox. We tested DefenseWall in the latest Beta Version together with Chromium and downloading potential threats from P2P Networks on our system. It protected successful from Spyware, Adware, Keyloggern, Rootkits und Viruses found on emule search and on LimeWire (Gnutella) where the most Antivirus failed to detect. Read more here and here. The resource load is low at about 17 MB. The program is very light weight with around 5 MB. DefenseWall is a must have tool not only for file sharers! Ilya Rabinovich, SoftSphere Technologies gives to our readers 15 Licenses. Write a comment and tell us your AV Software Product which you are currently use. Under all comments we give out the licenses random on 31. March 2011. Please Count me in Bro! This Antivirus is really great working Bro! Hope I can win a license for this one! Oh ya, for now I am using BitDefender Internet Security 2011.